Britain's Billy Joe Saunders WBO super-middleweight title fight against Serbia's Shefat Isufi has been moved to Stevenage's Lamex Stadium on 18 May. Saunders, 29, had been set to face Isufi, 29, at Wembley for the WBO interim world belt on 13 April. 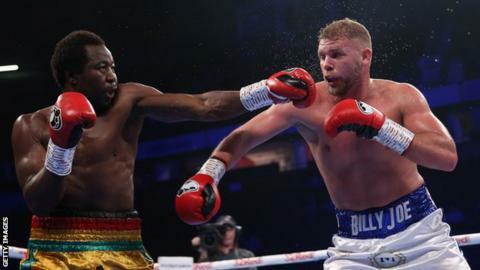 Former middleweight world champion Saunders returned to the ring in December after a year out during which he failed a doping test. He will become a two-weight world champion if he wins. Germany-based Isufi is undefeated at super-middleweight and has a record of 27-3-2 with 20 KOs. Promoter Frank Warren said: "We were stuck with no London venue available in May, so we decided to think outside the box, go local to Bill and bring the fight to Stevenage FC. "It's a good facility which will have a 10-12,000 capacity for boxing." The belt has been vacated by current holder Mexico's Gilberto Ramirez, who moved up to light-heavyweight, though there would be a unification bout if he returns to the division.